Last spring Murray's mom gave Sara Wells the cutest orange and white ruffly leggings. They immediately became her very favorite pants. She wore them almost every day at some point during the day for a year and a half. I finally had to hide them from her because they were way to small. Even with Sara Wells wearing these pants every day, pulling them out of the dirty clothes, finding them in all of my hiding places, I still loved them. I was just as sad as she was to give up the ruffly pants. I am not going to lie, I don't miss seeing them every day, but they are the cutest things! 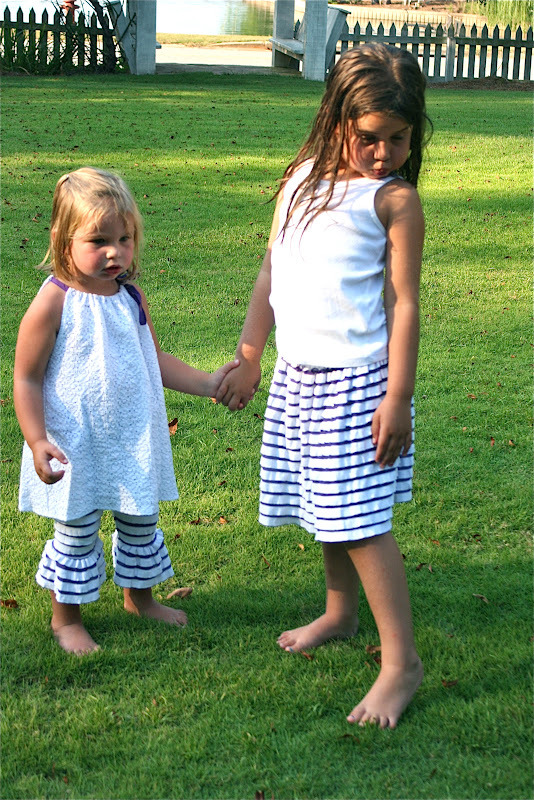 Not long after Sara Wells fell in love with her pants, I found ruffly fabric online. It was more expensive than I would like to spend on fabric, especially when I was buying for 2! So I put the idea of making more leggings for Sara Wells on the back burner for awhile. Then one day while perusing the fabric section of Hobby Lobby, I saw something ruffly on the back wall. I walked over to the fabric trying not to get excited because I just knew Hobby Lobby was not going to have the fabric I had fallen in love with. But low and behold they did! There on the shelf were several different selections of ruffly fabric! Now, I will say the selection is not as great as rufflefabric.com, but I saw the purple and white and knew the girls would be thrilled. With the 40% off coupon that Hobby Lobby always has, I ended up paying $15 for 2 yards of (60 inch wide) fabric. and the skirt for Ella. and actually like to wear them together (which is never a guarantee!). Since I made Ella's skirt, I have made several others because 2 yards of ruffly fabric goes a very long way and they are so easy to make!!! Today I am sharing 2 very, very easy skirts to make with ruffly fabric (just slight variations) for two reasons. One is because they will definitely be your little girl's favorite skirt and yours too because they do not wrinkle and always look cute! But the main reason I am sharing these tutorials with you has a much deeper meaning. A couple of months ago a blog that I follow, Project Run and Play, mentioned that they would be undertaking a new project in the month of July, Skirting the Issue. Usually the blog is dedicated to a Project Runway-ish competition focusing on kids clothes. But for the month of July they are dedicating their blog to skirts. And not just skirts for skirts sake, but providing daily tutorials for skirts with the hopes of inspiring their readers to make skirts to donate to girls in foster care. Sewing is something that I love! The Lord has given me a love for sewing, but I have never really used it as a way to bless others (besides my family). When I read about this project, I knew immediately that this was something that I could participate in. And since I still had fabric left over, I knew I could easily make these skirts without even having to go to the store! 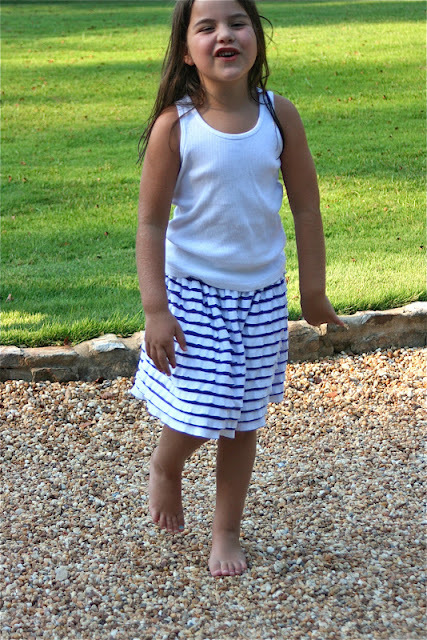 So, here are two ways to make a ruffly skirt depending on what size elastic you have. And I promise you, these skirts can be completely finished in less than 30 minutes. Now if you have kids who are constantly needing water or dry clothes or band aides or a snack or... it may take a little longer, but not much! This is the version I made for Ella and one of the skirts to donate. 1. Measure your fabric and cut. For this skirt I think it is the cutest if you use the entire width of the fabric. So, the fabric cut selvage to selvage. Because you are using a 2 inch wide elastic be sure to take that into account for the length of the skirt. I wanted Ella's skirt to be around 13 inches long, so I cut the skirt length at 11.5 inches. If you look closely at this picture you will see how I flipped the ruffle back and cut under the ruffle. This is what your fabric will look like after it is cut. This has got to be the greatest fabric ever because that is all you have to do, just cut and the bottom ruffle on the fabric covers the raw edge and the raw edge does not fray! So that means no hem is necessary! It is the best! 2. Pin right sides together. This is one step that you want to give a little attention to because you want to make sure that all the ruffles are laying in the right direction, they all need to go down. 3. Sew right sides together and finish seam. At this point you will have a large tube. 4. Measure your child's waist and cut the elastic your child's waist measurement plus one inch. Then sew right sides together of the elastic with a 1/2 inch seam allowance. I personally like using a small zig zag stitch. 5. Fold back the ends of the elastic and sew it flat onto the elastic with a small zig zag stitch. 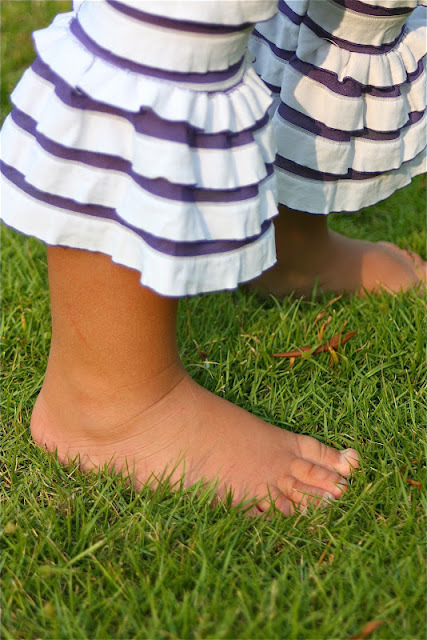 This step is so that little girls will not have an itchy seam in the back. One itchy place on an outfit will keep Ella from wearing it, no matter how cute it is! So, I definitely take extra measures for comfort! So, at this point, you have a tube of fabric and a tube of elastic. 6. 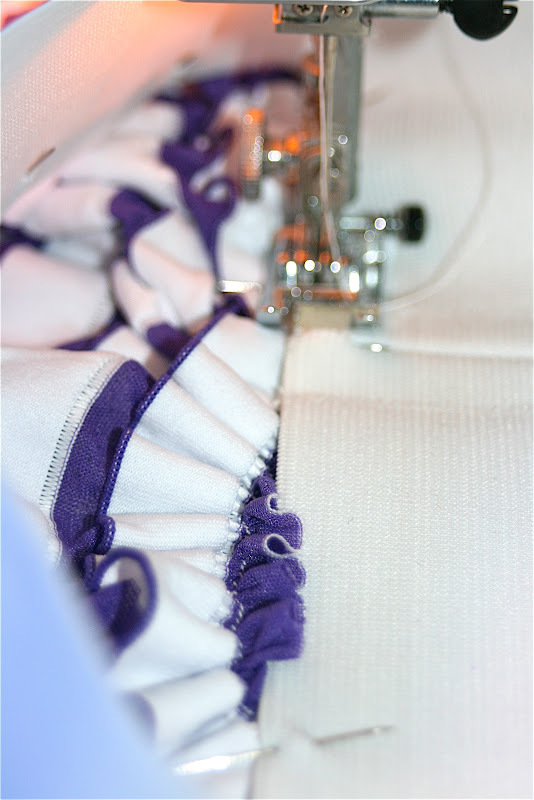 Sew a gathering stitch across the top of the skirt fabric and then gather the skirt fabric to fit the tube of elastic. 7. Pin the right side of the skirt to the wrong side of the elastic (sorry no picture) matching the seam of the elastic to the seam of the skirt. 8. 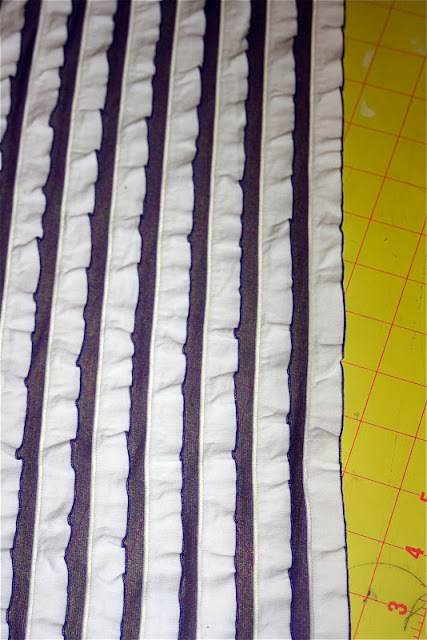 Sew the skirt to the elastic using a small zig zag stitch. If you look at this picture, you will see how I lined up the fabric to know where to sew. I just lined the elastic up on the top of the white ruffle (this will make more sense when you are actually looking at your fabric). And that is it! It really is that easy!!! For the second skirt I made, I did an encased elastic waist band because I still had enough fabric to make another skirt, but did not have anymore wide elastic. I knew there was no way I was going to be able to go to the store before we left town, so I thought the skirt would be just as cute without the wide waist band, especially since most of the time it is covered up anyways! 1. Determine desired skirt length and then add 1 1/4 inch (I used 1 inch elastic) for the waist band. 3. Pin and sew right sides together and then finish seam. 4. Measure 1 1/4 inch from the top of the skirt to make the encasing for the elastic waistband. Now this is where you will really love this fabric when making a skirt. My ruffly fabric measured exactly 1 1/4 inches between the ruffles. So all I had to do was fold the fabric over and sew the waistband. No ironing necessary! leaving an opening in the bottom of the waist band to feed my elastic into. And remember this fabric does not fray so you do not need to worry about raw edges! 6. Cut a piece of elastic your child's waist measurement plus 1/2 inch for seam allowance. Then feed it through the cased opening using a large safety pin. 7. After you have fed the elastic through the waist band, sew the ends of the elastic together. Then finish sewing closed the cased opening. And there you have it! 2 VERY simple and VERY cute ruffly skirts! My prayer as I made these skirts was that the two little girls who receive these skirts will know that they are loved. I hope that they will know that they are so special that someone made a skirt just for them. And not only are they just special enough that someone made them a skirt, but knowing they are loved by someone will help them understand that they are loved by a Heavenly Father regardless of how they are treated by their earthly father. And they are so special to Him that He sent His only Son to die just so that they can spend eternity in Heaven with Him. I know, big hopes for a little skirt. But you never know how God can use one new skirt in the life of a child! 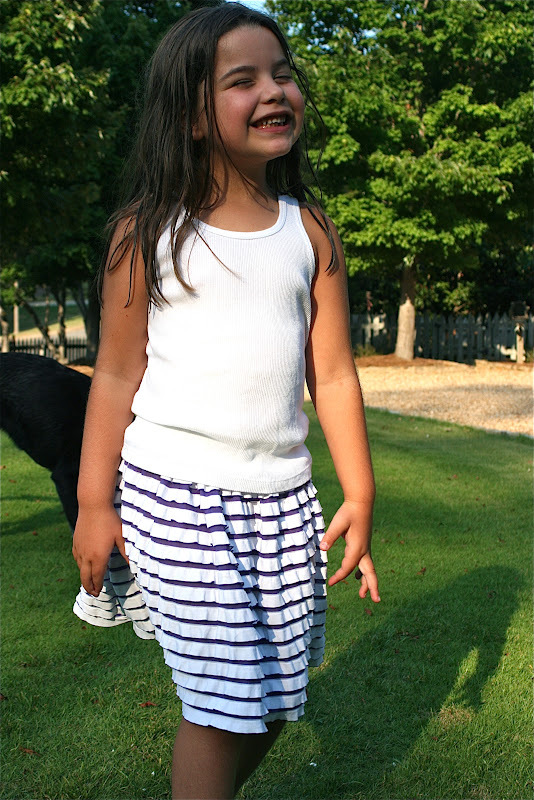 If you are sending skirts to the Alabama Baptist Children's Home, they request that only new items be donated. Because of limited storage space, they do not accept any used articles of clothing. And also, their main need for clothes is 0 - 5 years old. If you do not live in the Birmingham area, of course you can still send your skirts to the Birmingham Children's Home, but I would encourage you to get in touch with the foster care agency in your community and send the skirts to the girls in your community. What an awesome project! 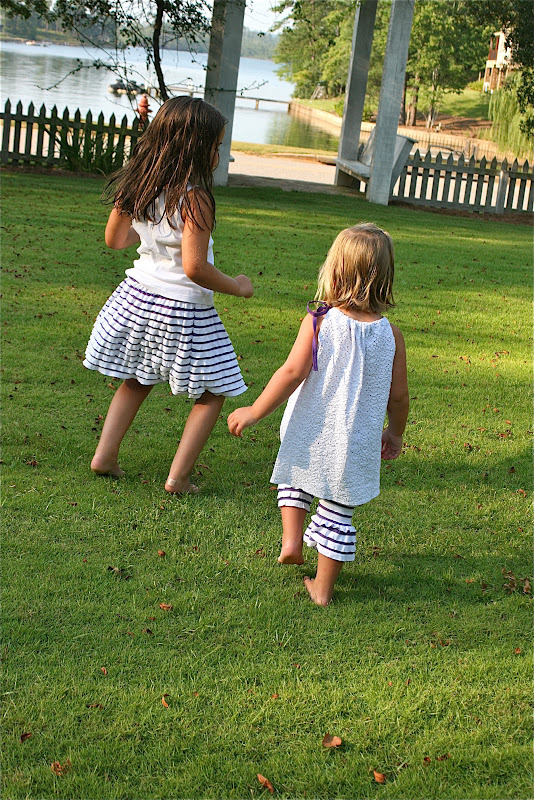 Those little girls are going to look precious in their ruffly skirts.